riding on the mountains i dont know how much i lean, or what is the max lean. i know on a sport bike 55 degree is the max, but how do i know what does a 55 degree lean feels like? the new dunlop q4 able to lean 62 degree, even more scary to test it out. i drag my knee before. i been playing Ride 2,3 ,moto gp 17 and notice at 52 degree the rider is dragging knee, so it means your knee is an indicator how far you lean, a general guide, but can it tell you your max lean? no right. what if you stick out your toe more, so when it hits the ground you know for sure you reach the max lean fore your tires. Wish there is a motorcycle stand to attach to you bike and just lean to the max and get use to what does it feels like, so next time you dont have to worry about not leaning enough so you can focus on gas. Developing a feeling with the tire is half the battle of any motorcycle racer and it is one of the hardest skills to learn. A lot of tire and frame research efforts go into delivering good signals to the rider. If you drive any go-kart at racing pace you already know. In most corners you want to ride as fast as you can without sliding so you become very aware of how the tires are reacting. The knee is a reference gauge for any racer but like you say it doesn't mean it solves all problems. Max lean angle is a function of speed, tire technology, temperature, weight distribution and I am sure many other factors. While riding on the mountains you should not be pushing your tires to the limit; that just means excess of danger with little reward or improvement of skills. Please, note that I mention the limit of physical pavement-rubber traction and not lean angle of the chassis. Lean angle is a natural consequence of the centripetal forces of turning and it mainly depends on the square of the speed of the bike and on the inverse of the radius of the turn: meaning in simpler terms that double the entry speed (but same radius) puts four times more lateral stress on the contact patches of the tires and that half the radius of turn (but same speed) puts double stress on those patches. The manufacturer of your sport bike tries to provide a lean clearance that matches the maximum traction capability of your tires in good pavement conditions. The resulting angle of lean must be there to compensate for those cornering lateral forces in such a way that the bike keeps its lateral balance (not crashing over towards the outside of the turn). What is happening at the same time? Both tires "feel" an increased weight of your body and the bike, as much as double (2g) around 60-degree lean; hence their sections become less pliable and have to work harder to keep grip. The suspension is now compressed by the added weight and its work to follow the surface and keep the rubber in contact with it is more difficult because the direction of the strokes is inclined while the irregularities of the track keep pushing it vertically. All the above works as described if, and only if, you have the luxury of clean dry pavement. Otherwise, your tires will have less capacity to resist the action of those lateral forces (assuming good conditions of tires, inflation and suspension, as well as good riding techniques and per-tire-weight distribution). How much less traction will you have? That is something impossible to predict on public roads, where you could suddenly find spills of oil, Diesel, anti-freezing coolant, or sand or street markings or steel manholes or animal carcasses. If you ride on the edge of available traction, you will not have available traction to use in the event of an emergency or evasive maneuver, like braking or swerving. You always choose entry speed to negotiate certain radius of a fixed corner, lean angle follows that decision adjusting itself to keep balance, and both tires and suspensions are loaded with extra forces, which should never grow beyond the limits of traction for the specific conditions of the road. That is accurate, the frames (and suspensions) of motorcycles with tires of wide section will lean a few degrees more than the theorical lean angle shown in the graphic, which is the angle formed between a vertical line (the direction of gravity) and another line connecting the contact patches and the combined center of gravity of bike plus rider (please see first attached diagram of gravity and lateral forces). Note that in the case shown in that third picture-diagram of forces (Stoner's), the combined CG is relocated sideways enough to exactly compensate for the off-center relocation of the contact patch, reducing the actual lean angle of the suspensions and frame and increasing angular clearance. Approximately 1.96 g. That magnitude would be approximately the result of multiplying the standard acceleration due to gravity (32.2 feet/second square) by the tangent of 63 degrees (1.96). That means that, depending on specific front-rear weight distribution, each contact patch would be feeling a lateral force (trying to make it slide over) which magnitude would be a little less than the combined static weight of bike, fluids and rider. That makes that rubber compund a fantastic sticky and resilient material. The IMU (Intertial Measurement Unit) in the MotoGP bike is made up of gyroscopes and accelerometers (usually a 6-axis system) that gather information on the bike’s chassis attitude. Because the previous research we did here (above picture), we can assume that with proper hang-off of the rider, the tire-width offset is compensated in such a way that the chassis lean angle is pretty close to the theorical dynamic lean angle (line of combined CG to centers of contact patches respect to vertical). The concept that I would like to present to new riders is that the magnitude of lean angle always follows the magnitude of those lateral forces, which we create by selecting the speed of cornering for a particular curve. In other words, although we surely can improve the chassis lean angle by hanging-off, we can't directly manipulate or choose the theorical dynamic lean angle of the bike, which is a natural balancing reaction (the CG-frame-tires aligns with the new resultant leaned force of cornering) and only depends on the square of the speed and on the radius of the trajectory we choose. It could be off some degree. 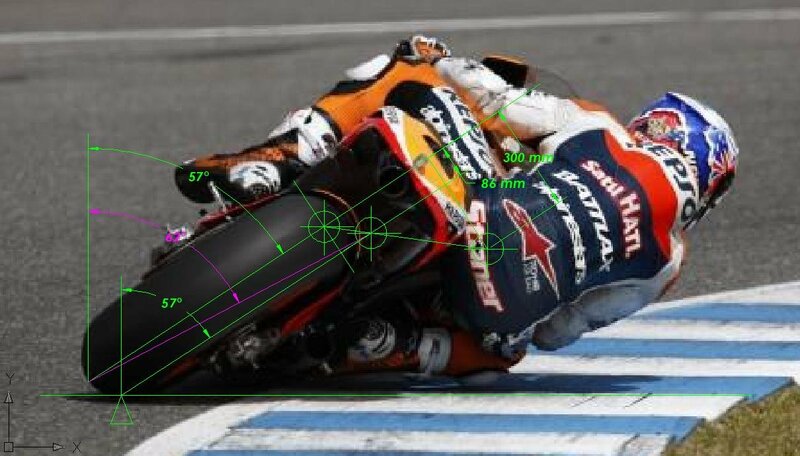 As far as I understand it, the lean angle shown in the display of a MotoGP is calculated based on the rate of leaning over speed from a vertical, using radial acceleration data supplied by the IMU. Because the inertial reference of the bike changes when cornering, there is no way for the blind (it has no horizon visual reference) IMU to directly "feel" and measure lean angle. Any blindfolded passenger of that bike would be lost about angle as well, his/her only clue about the intensity of cornering and resulting lean would be the sensation of increased body weight. The only accurate way to calculate the lateral acceleration and resulting force is by accurately knowing both speed and radius of the trajectory. "The barriers then are both physical sensation and visual orientation, and I believe there is a make-or-break point. That point is 45 degrees of lean. At 45 degrees, the forces are a bit out of the ordinary. Along with the normal 1g down, we now also have a 1g lateral load. As a result, the bike and our bodies experience an increase in weight. That's not native to us, and acts as both a distraction and a barrier. Once we become comfortable with 45 degrees and attempt to go beyond that, the process begins to reverse. Immediately we have more lateral load than vertical load, and things begin to heat up. Riders apparently have difficulty organizing this. Suddenly, we are thrust into a sideways world where the forces escalate rapidly. While it takes 45 degrees to achieve 1g lateral, it takes only 15 degrees more to experience nearly double that (depending on rider position and tire size)." Recently saw a video with Ken Condon about street riding, where he suggested you should practice exploring and widening your limits frequently on the track and ride far from your limits on the road. The reason for the practice was to ensure you do not freeze up when entering a corner much faster than planned, or that you run off the road not because the corner could not be taken, but because you feared to lean the bike far enough over. I guess that's where schools like CSS come in and do their good, by teaching riders to expand their personal limits in a safe environment and with the proper tuition. I texted one of the engineers at Kalex and asked him "How do they do 57 degrees? My tires start to slide at around 53 degrees"
His reply: "It's Magic :)"
Tire coefficient of friction (directly also dependent on track surface) is obviously the biggest variable assuming you don't drag any bike parts before hand. As the OP said - Q4 can do 62 deg lean angle. I don't see how that is possible because my logic says that Moto2 tires must have more grip, so why would moto2 riders stop at 58 degrees? If they could lean more, believe me, they would. They don't have a psychological complex with fear of lean - they lean until the tires start to slide. I could be wrong (again), but isn't actual cornering speed also a part here, not just lean? If you lean out you can lean the bike further than if hanging off to the inside, for instance, but cornering speed will be lower. A Moto3 bike/rider combination will corner noticeably faster than a MotoGP bike, bit with quite a bit less lean. I would expect the Moto2 machines to be somewhere in between. I would imagine this is the result of overall weight, rider-to-bike weight ratio, CoG and tire width, but I am not sure. Mph has nothing to do with it. I know it’s counter intuitive but i will explain. If your tire coefficient of friction is 1, your tire can only maintain 1G force. Mid corner where you don’t accelerate or decelerate (can be very short amount of time in this zone) your tire will only be subjected to lateral G forces. so your tires can only do 1G so your max lean is 45 degrees. At 45.1 you start to slide ok? 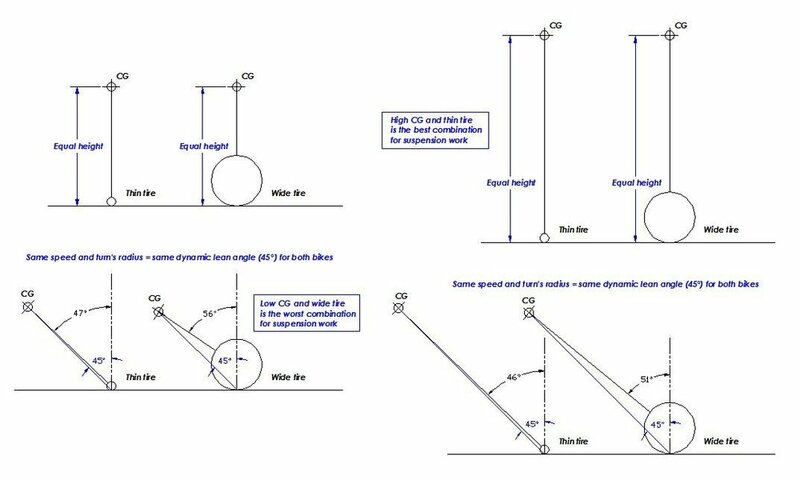 so a 200 pound bike leaning at 45 degrees in at 300 foot radius would do the exact same speed as a 900 pound bike at 45 degree at 300 radius. moto3 bikes have skinnier tires so their effective lean is close to that of the bike lean . bike lean is always more than effective lean . 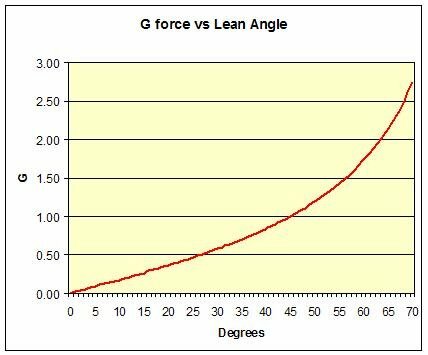 At 45 degree effective lean you will always generate 1G lateral regardless of speed. Simply does NOT matter. i know it is counter intuitive but it is math and physics. i hope this reply is not frustrating to anyone. It may be that I am confusing things here, and if so I apologize, but I do not see anything in your explanation that counter what I wrote? But since tires have width, bikes (combined with rider) must lean further than 45 degrees in order to obtain 1G. The wider the tire, the more extra lean is needed. Also as a result of tire width, center of gravity comes into play; the lower it is, the more one must lean for any given cornering speed. Finally, again due to the tires, length matter, with longer wheelbases needed extra lean. Finally, since a rider can influence the combined lean, the influence will be greater the lighter the bike and the heavier the rider. So a very light, short bike with narrow tires and a rider hanging well off to the inside can reach this 1G limit at a shallower bike lean angle than a heavy, long bike with wide tires. And I would expect the Moto2 to sit somewhere between the MotoGP and Moto3 bikes, albeit closer to the former, meaning bike lean should end up somewhere between the two for a Moto2 bike. Ok I see what the confusion is don’t worry. A light bike moto3 with skinny tires will lean to 40 degrees bike lean and because the rider is hanging off to the inside a lot, the effective lean angle - contact patch to CG is 45 degrees. So now this bike is cornering at exactly 1G. Good so far? We agree. Now a heavier bike moto2 rider is hanging off the same distance. But because the moto2 bike weighs more, to achieve an effective lean of 45 degrees (patch to CG) the bike must lean to 43 deg. Now this bike also corners at 1G exactly. So what is the difference in speed around a bend between the two situations? None. Both bikes are at 1G and will make the same mph for a given radius. So why do small bikes have more corner speed? Or do they? I have heard this mentioned before, but the science does not agree. So maybe it’s bogus info - we have to keep an open mind. The main thing that matters is coefficient of friction of the tire. We know MotoGP tires have more grip than moto2 and moto3. So actually MotoGP tire may be able to get to 1.9 lateral gs (I think around 60 deg) and a moto3 maybe only 55deg lean. Important to understand, bike lean angle doesn’t really matter for corner speed. Only contact patch to CG. i will say, that if bike lean is more vertical the suspension will work better so you will generate more mechanical grip. But it’s very small differences especially on a smooth track. The article from cycleworld pretty much explained what is happening and this phenomenon of why moto3 corner faster than motogp so I suggest you read it very carefully. The MotoGP video is leaving out some important details in order to glorify and promote moto3 in with this concept of "hey, moto3 still has its strong points, they corner faster". Sort of like - rooting for the underdog. The reality is that moto3 bikes do not do anything better than motogp bikes besides maybe the flick rates (from side to side). They certainly are NOT capable of cornering at a higher speed than motogp bikes and the article from cycleworld alluded to that fact. Imagine a motorcycle doing circles in a parking lot. Constant radius circles non stop at a constant speed. The higher the lean angle, the faster these circles can be negotiated regardless of the weight of the bike. At a certain lean angle, a given motorcycle tires would start to slide. This is dependent on the coefficient of friction of the tires. If the tire coefficient of friction is 1, anything past 45 degrees would result in a slide, and if not corrected, a fall. If the tire coefficient of friction is 2, anything past 63.4 degrees would result in a slide, and if not corrected, a fall. We know that motogp tires have a higher coefficient of friction compared to the japanese made KR133 dunlops used by moto3. So moto3 bikes can not lean as far as motogp bikes. The article explained this by how moto3 riders do not drag their elbows, but motogp do this frequently, and even tuck in their elbows a bit to allow even MORE lean angle. I will try to get moto3 data for Valencia and compare it to moto2 data to compare max lean angles and see which achieve higher. I know moto2 usually do around 56-58 degrees. Motogp can get to 60-63. So why do moto3 bikes have a FASTER mid corner speed than Moto2 or MotoGP? The article also explained this. It's because moto3 bikes do not have high acceleration potential, so their biggest "tool" for speed is momentum and mid corner. Any 1mph they overslow in mid-corner, is a 1mph they will very much struggle to get back. So moto3 riders choose to put emphasis on the corrector strengths of their machines by choosing lines that have the absolute highest radius. MotoGP riders will purposefully create a tighter radius in the entry part of the corner, in order to greatly increase the radius on the exit portion, so they may unleash their 260hp. If a MotoGP bike used the exact same line as a moto3 bike, it would not be competitive compared to other MotoGP bikes as it would not be able to get on the gas early and hard. But its mid corner speed would be greater than that of the moto3 bikes because it is able to achieve higher lean angles due to its greater tire coefficient of friction. Please remember, for constant radius, the only thing that can increase speed is lean. Maximum lean is maximum lateral G's the tire is capable of. Weight of the machine, has nothing to do with it. So what to do? Get stickier tires and you can lean more and you can have more speed at the max lean portion of every corner.